From 2015 to 2016, the official poverty rate fell by 0.8 percentage points, as household income rose modestly, albeit unevenly, throughout the income distribution. This was the second year in a row that poverty declined, and at 12.7 percent, the official poverty rate in 2016 was statistically the same as it was in 2007, just prior to the Great Recession. The poverty rate remains significantly higher than the low point of 11.3 percent it reached in 2000. The SPM corrects many potential deficiencies in the official rate. For one, it constructs a more realistic threshold for incomes families need to live free of poverty, and adjusts that threshold for regional price differences. For another, it includes as income many resources available to poor families, such as Medicare, food stamps, and other in-kind government benefits. As shown in Figure A, a larger proportion of Americans are in poverty as measured by the SPM than the official measure reports. (Importantly, however, researchers who constructed a longer historical version of the SPM found that it shows greater long-term progress in reducing poverty than the official measure.) In 2016, the SPM declined by 0.6 percentage points to 13.9 percent. Under the SPM, 44.6 million Americans were in poverty last year, compared with 40.7 million Americans under the “official” poverty measure. Note: 2013 values reflect the CPS ASEC redesigned income questions. 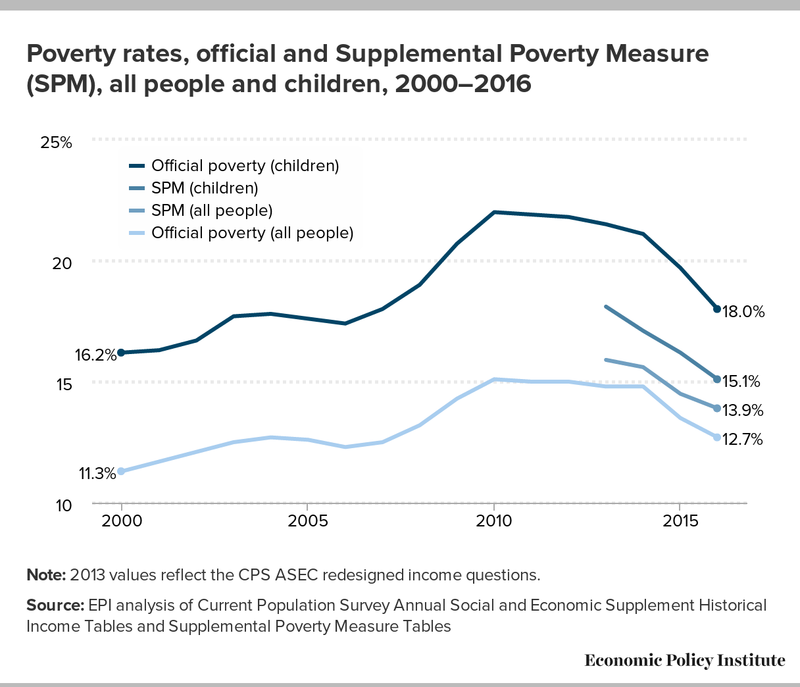 The SPM data also show a lower rate of child poverty than the official statistics, primarily as a result of the SPM’s inclusion of noncash income from government assistance programs. In 2016, the official child poverty rate was 18.0 percent—a decline of 1.7 percentage point from 2015 that brought the child poverty rate down to the same rate that existed in 2007 prior to the Great Recession. Nevertheless, the official child poverty rate remains 1.8 percentage points higher than it was in 2000. Under the SPM, in 2016 the child poverty rate fell by 1.1 percentage points to 15.1 percent. Because it incorporates noncash sources of income into its calculations, the SPM allows us to see the enormous impact that the full spectrum of government anti-poverty programs have in reducing hardship for millions of Americans. 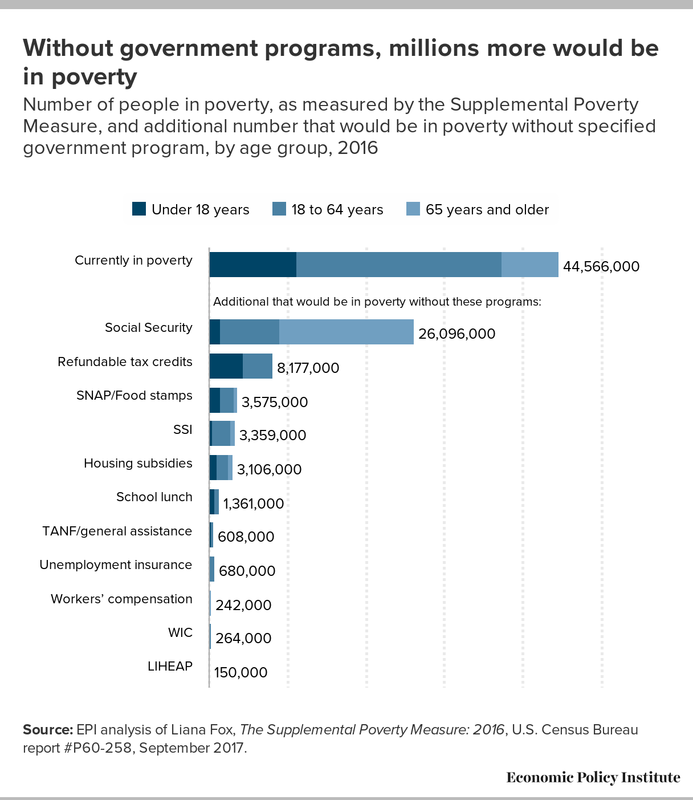 As shown in Figure B, government assistance programs are directly responsible for keeping tens of millions of people out of poverty. Social Security is, by far, the most powerful anti-poverty program in the United States. In 2016, it was responsible for keeping 26.1 million people, or 8.2 percent of Americans, above the SPM poverty threshold. Refundable tax credits, such as the Earned Income Tax Credit and the Child Tax Credit, kept 8.2 million, or 2.6 percent of Americans above the SPM poverty threshold. Smaller (but still vital) programs, such as the Supplemental Nutrition Assistance Program or SNAP (commonly known as “food stamps”), Supplemental Security Income, and housing vouchers, each prevented over 3 million people from falling into poverty. Source: EPI analysis of Liana Fox, The Supplemental Poverty Measure: 2016, U.S. Census Bureau report #P60-258, September 2017. Government assistance programs were particularly important in keeping children out of poverty. As shown in Figure B, of the 8.2 million Americans that refundable tax credits lifted out of poverty, 4.4 million were children. Similarly, of the 3.6 million Americans that SNAP kept out of poverty, 1.5 million were children. Housing subsidies shielded 1.0 million children from poverty. Even Social Security has a large impact on the welfare of children, lifting 1.5 million kids above the poverty line. With recent budget proposals calling for cuts to these programs, lawmakers need to recognize how critical these programs are for helping families stay afloat. The lowest-income households in America (the lowest fifth of the income distribution) suffered the largest average percentage losses of any income group in the Great Recession, and they are the only income group whose average household income remains significantly lower than prior to the recession. Under such circumstances, there can be little justification for weakening the programs upon which many of these households rely. 1. In 2016, the Census Bureau made minor changes to the SPM’s methodology. At this time, they have only published historical SPM poverty rates under this new methodology back to 2013.